The Lytham St Annes Mersey class All-weather Lifeboat (ALB) Her Majesty the Queen was launched this afternoon (Sunday 20th September) to search when a “Mayday” distress call was received by the Coastguard from the yacht Mary claiming she was in danger. The Coastguard concentrated the search at first around the Dee estuary and tasked Hoylake Lifeboat to search the area but when nothing was found, and with concern growing for the casualty, the Lytham St Annes Lifeboat was asked to launch and join in. The Lytham St Annes Lifeboat was launched at 2.35pm under the command of 2nd Coxswain John Atkinson and headed south towards Formby Point to try to locate the missing vessel. Shortly afterwards the Coastguard also called out the New Brighton Atlantic class Inshore Lifeboat and the new Coastguard Search & Rescue helicopter (Rescue 936) from Caernarfon airport to assist. 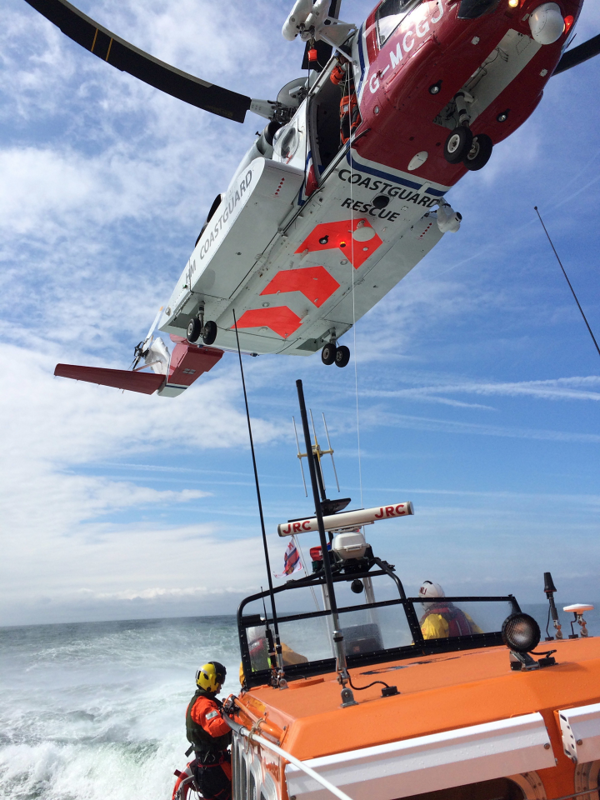 The three Lifeboats and the helicopter made a thorough search of the area. Nothing more had been heard from the yacht after the initial “Mayday” call and with no exact position having ever been given and no radar contacts, the Coastguard eventually scaled down the search, releasing the helicopter to return to base and then finally the Lifeboats. The Lytham St Annes Lifeboat arrived home after over 5 hours at sea and returned to her boathouse to be washed down, refuelled and made ready for the next time she is called out. The new red and white Coastguard helicopter based at Caernarfon airport has now taken over search & rescue duties in the area from the familiar yellow RAF Sea King helicopters based at RAF Valley on Anglesey. The last one of these to serve in this area left RAF Valley on 10th September 2015 and is to be sold off.